This article is about the economic theory. For the biological term and other uses, see Mutualism (disambiguation). Mutualism is an economic theory and anarchist school of thought that advocates a society with free markets and occupation and use (or usufruct) property norms. One implementation of this scheme involves the establishment of a mutual-credit bank that would lend to producers at a minimal interest rate, just high enough to cover administration. Mutualism is based on a version of the labor theory of value holding that when labor or its product is sold, in exchange it ought to receive goods or services embodying "the amount of labor necessary to produce an article of exactly similar and equal utility". Mutualism originated from the writings of philosopher Pierre-Joseph Proudhon. Mutualists disagree with the idea of individuals receiving an income through loans, investments, and rent as they believe these individuals are not laboring. Though Proudhon opposed this type of income, he expressed that he had never intended "to forbid or suppress, by sovereign decree, ground rent and interest on capital. I think that all these manifestations of human activity should remain free and voluntary for all: I ask for them no modifications, restrictions or suppressions, other than those which result naturally and of necessity from the universalization of the principle of reciprocity which I propose". Insofar as they ensure the worker's right to the full product of their labor, mutualists support markets and property in the product of labor. However, they argue for conditional titles to land, whose ownership is legitimate only so long as it remains in use or occupation (which Proudhon called "possession"), thus advocating personal property, but not private property. Although mutualism is similar to the economic doctrines of the 19th-century American individualist anarchists, unlike them mutualism is in favor of large industries. Therefore, mutualism has been retrospectively characterized sometimes as being a form of individualist anarchism and as ideologically situated between individualist and collectivist forms of anarchism as well. Proudhon himself described the "liberty" he pursued as "the synthesis of communism and property". Some consider Proudhon to be an individualist anarchist while others regard him to be a social anarchist. Mutualists have distinguished mutualism from state socialism and do not advocate state control over the means of production. Benjamin Tucker said of Proudhon that "though opposed to socializing the ownership of capital, [Proudhon] aimed nevertheless to socialize its effects by making its use beneficial to all instead of a means of impoverishing the many to enrich the few [...] by subjecting capital to the natural law of competition, thus bringing the price of its own use down to cost". As a term, mutualism has seen a variety of related uses. Charles Fourier first used the French term mutualisme in 1822, although the reference was not to an economic system. The first use of the noun mutualist was in the New-Harmony Gazette by an American Owenite in 1826. In the early 1830s, a French labor organization in Lyons called themselves the Mutuellists. 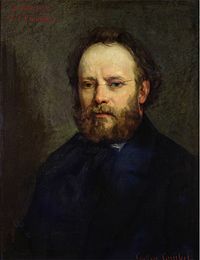 Pierre-Joseph Proudhon was involved with the Lyons mutualists and later adopted the name to describe his own teachings. In What Is Mutualism?, Clarence Lee Swartz gives his own account of the origin of the term, claiming that "[t]he word "mutualism" seems to have been first used by John Gray, an English writer, in 1832". When Gray's 1825 Lecture on Human Happiness was first published in the United States in 1826, the publishers appended the Preamble and Constitution of the Friendly Association for Mutual Interests, Located at Valley Forge. 1826 also saw the publication of the Constitution of the Friendly Association for Mutual Interests at Kendal, Ohio. By 1846, Proudhon was speaking of mutualité in his writings and he used the term mutuellisme at least as early as 1848 in his "Programme Révolutionnaire". In 1850, William B. Greene used the term mutualism to describe a mutual credit system similar to that of Proudhon. In 1850, the American newspaper The Spirit of the Age, edited by William Henry Channing, published proposals for a "mutualist township" by Joshua King Ingalls and Albert Brisbane, together with works by Proudhon, William B. Greene, Pierre Leroux and others. Proudhon ran for the French Constituent Assembly in April 1848, but was not elected, although his name appeared on the ballots in Paris, Lyon, Besançon and Lille. He was successful in the complementary elections of June 4 and served as a deputy during the debates over the National Workshops, created by the 25 February 1848 decree passed by Republican Louis Blanc. The workshops were to give work to the unemployed. Proudhon was never enthusiastic about such workshops, perceiving them to be essentially charitable institutions that did not resolve the problems of the economic system. He was against their elimination unless an alternative could be found for the workers who relied on the workshops for subsistence. Proudhon was surprised by the French Revolution of 1848. He participated in the February uprising and the composition of what he termed "the first republican proclamation" of the new republic. However, he had misgivings about the new provisional government headed by Jacques-Charles Dupont de l'Eure (1767–1855), who since the French Revolution in 1789 had been a longstanding politician, although often in the opposition. Proudhon published his own perspective for reform which was completed in 1849, Solution du problème social (Solution of the Social Problem), in which he laid out a program of mutual financial cooperation among workers. He believed this would transfer control of economic relations from capitalists and financiers to workers. The central part of his plan was the establishment of a bank to provide credit at a very low rate of interest and the issuing of exchange notes that would circulate instead of money based on gold. Mutualism has been associated with two types of currency reform. Labor notes were first discussed in Owenite circles and received their first practical test in 1827 in the Time Store of former New Harmony member and individualist anarchist Josiah Warren. Mutual banking aimed at the monetization of all forms of wealth and the extension of free credit. It is most closely associated with William B. Greene, but Greene drew from the work of Proudhon, Edward Kellogg and William Beck as well as from the land bank tradition. Mutualism can in many ways be considered "the original anarchy" since Proudhon was the first to identify himself as an anarchist. Though mutualism is generally associated with anarchism, it is not necessarily anarchist. Historian Wendy McElroy reports that American individualist anarchism received an important influence of 3 European thinkers. One of the most important of these influences was the French political philosopher Pierre-Joseph Proudhon, whose words "Liberty is not the Daughter But the Mother of Order" appeared as a motto on Liberty's masthead" (influential individualist anarchist publication of Benjamin Tucker). For American anarchist historian Eunice Minette Schuster, "[i]t is apparent [...] that Proudhonian Anarchism was to be found in the United States at least as early as 1848 and that it was not conscious of its affinity to the Individualist Anarchism of Josiah Warren and Stephen Pearl Andrews. [...] William B. Greene presented this Proudhonian Mutualism in its purest and most systematic form". After 1850, Greene became active in labor reform. He was elected vice-president of the New England Labor Reform League, the majority of the members holding to Proudhon's scheme of mutual banking; and in 1869 president of the Massachusetts Labor Union. He then publishes Socialistic, Mutualistic, and Financial Fragments (1875). He saw mutualism as the synthesis of "liberty and order". His "associationism [...] is checked by individualism. [...] "Mind your own business", "Judge not that ye be not judged". Over matters which are purely personal, as for example, moral conduct, the individual is sovereign as well as over that which he himself produces. For this reason, he demands "mutuality" in marriage—the equal right of a woman to her own personal freedom and property". The economic principles of Modern Socialism are a logical deduction from the principle laid down by Adam Smith in the early chapters of his "Wealth of Nations," – namely, that labor is the true measure of price. [...] Half a century or more after Smith enunciated the principle above stated, Socialism picked it up where he had dropped it, and in following it to its logical conclusions, made it the basis of a new economic philosophy. [...] This seems to have been done independently by three different men, of three different nationalities, in three different languages: Josiah Warren, an American; Pierre J. Proudhon, a Frenchman; Karl Marx, a German Jew. [...] That the work of this interesting trio should have been done so nearly simultaneously would seem to indicate that Socialism was in the air, and that the time was ripe and the conditions favorable for the appearance of this new school of thought. So far as priority of time is concerned, the credit seems to belong to Warren, the American, – a fact which should be noted by the stump orators who are so fond of declaiming against Socialism as an imported article. Mutualist ideas found fertile ground in the nineteenth century in Spain. In Spain, Ramón de la Sagra established the anarchist journal El Porvenir in A Coruña in 1845 which was inspired by Proudhon´s ideas. The Catalan politician Francesc Pi i Margall became the principal translator of Proudhon's works into Spanish and later briefly became president of Spain in 1873 while being the leader of the Democratic Republican Federal Party. According to George Woodcock, "[t]hese translations were to have a profound and lasting effect on the development of Spanish anarchism after 1870, but before that time Proudhonian ideas, as interpreted by Pi, already provided much of the inspiration for the federalist movement which sprang up in the early 1860's". According to the Encyclopædia Britannica: "During the Spanish revolution of 1873, Pi y Margall attempted to establish a decentralized, or “cantonalist”, political system on Proudhonian lines". Pi i Margall was a dedicated theorist in his own right, especially through book-length works such as La reacción y la revolución (Reaction and Revolution from 1855), Las nacionalidades (Nationalities from 1877) and La Federación (The Federation from 1880). For prominent anarcho-syndicalist Rudolf Rocker, "[t]he first movement of the Spanish workers was strongly influenced by the ideas of Pi y Margall, leader of the Spanish Federalists and disciple of Proudhon. Pi y Margall was one of the outstanding theorists of his time and had a powerful influence on the development of libertarian ideas in Spain. His political ideas had much in common with those of Richard Price, Joseph Priestly [sic], Thomas Paine, Jefferson, and other representatives of the Anglo-American liberalism of the first period. He wanted to limit the power of the state to a minimum and gradually replace it by a Socialist economic order". According to historian of the First International G. M. Stekloff, in April 1856 "arrived from Paris a deputation of Proudhonist workers whose aim it was to bring about the foundation of a Universal League of Workers. The object of the League was the social emancipation of the working class, which, it was held, could only be achieved by a union of the workers of all lands against international capital. Since the deputation was one of Proudhonists, of course this emancipation was to be secured, not by political methods, but purely by economic means, through the foundation of productive and distributive co-operatives". Stekloff contines by saying that "[i]t was in the 1863 elections that for the first time workers' candidates were run in opposition to bourgeois republicans, but they secured very few votes. [...] [A] group of working-class Proudhonists (among whom were Murat and Tolain, who were subsequently to participate in the founding of the (First) International issued the famous Manifesto of the Sixty, which, though extremely moderate in tone, marked a turning point in the history of the French movement. For years and years the bourgeois liberals had been insisting that the revolution of 1789 had abolished class distinctions. The Manifesto of the Sixty loudly proclaimed that classes still existed. These classes were the bourgeoisie and the proletariat. The latter had its specific class interests, which none but workers could be trusted to defend. The inference drawn by the Manifesto was that there must be independent working-class candidates". For Stekloff, "the Proudhonists, who were at that date the leaders of the French section of the International. They looked upon the International Workingmen's Association as a sort of academy or synagogue, where Talmudists or similar experts could "investigate" the workers' problem; wherein the spirit of Proudhon they could excogitate means for an accurate solution of the problem, without being disturbed by the stresses of a political campaign. Thus Fribourg, voicing the opinions of the Parisian group of the Proudhonists (Tolain and Co.) assured his readers that “the International was the greatest attempt ever made in modern times to aid the proletariat towards the conquest, by peaceful, constitutional, and moral methods, of the place which rightly belongs to the workers in the sunshine of civilisation". According to Stekoff, the Belgian Federation "threw in its lot with the anarchist International at its Brussels Congress, held in December, 1872...those taking part in the socialist movement of the Belgian intelligentsia were inspired by Proudhonist ideas which naturally led them to oppose the Marxist outlook". 19th-century mutualists considered themselves libertarian socialists and are still considered libertarian socialists to this day. While oriented towards cooperation, mutualists favor free market solutions, believing that most inequalities are the result of preferential conditions created by government intervention. Mutualism is something of a middle way between classical economics and socialism of the collectivist variety, with some characteristics of both. Modern-day mutualist Kevin Carson considers anarchist mutualism to be "free-market socialism". Proudhon supported labor-owned cooperative firms and associations, for "we need not hesitate, for we have no choice. [...] [I]t is necessary to form an association among workers [...] because without that, they would remain related as subordinates and superiors, and there would ensue two [...] castes of masters and wage-workers, which is repugnant to a free and democratic society" and so "it becomes necessary for the workers to form themselves into democratic societies, with equal conditions for all members, on pain of a relapse into feudalism". As for capital goods (man-made, non-land, "means of production"), mutualist opinions differs on whether these should be commonly managed public assets or private property. Mutualism also had a considerable influence in the Paris Commune. George Woodcock manifests that "a notable contribution to the activities of the Commune and particularly to the organization of public services was made by members of various anarchist factions, including the mutualists Courbet, Longuet, and Vermorel, the libertarian collectivists Varlin, Malon, and Lefrangais, and the bakuninists Elie and Elisée Reclus and Louise Michel". The primary aspects of mutualism are free association, reciprocity and gradualism (or dual power). Mutualism is often described by its proponents as advocating an "anti-capitalist free market". Mutualists argue that most of the economic problems associated with capitalism each amount to a violation of the cost principle, or as Josiah Warren interchangeably said, the "cost the limit of price". It was inspired by the labor theory of value, which was popularized, though not invented, by Adam Smith in 1776 (Proudhon mentioned Smith as an inspiration). The labor theory of value holds that the actual price of a thing (or the "true cost") is the amount of labor that was undertaken to produce it. In Warren's terms, cost should be the "limit of price", with "cost" referring to the amount of labor required to produce a good or service. Anyone who sells goods should charge no more than the cost to himself of acquiring these goods. Mutualists argue that association is only necessary where there is an organic combination of forces. For instance, an operation that requires specialization and many different workers performing their individual tasks to complete a unified product, i.e. a factory. In this situation, workers are inherently dependent on each other—and without association they are related as subordinate and superior, master and wage-slave. In cases in which production requires great division of labour, it is necessary to form an association among the workers [...] because without that they would remain isolated as subordinates and superiors, and there would ensue two industrial castes of masters and wage workers, which is repugnant in a free and democratic society. But where the product can be obtained by the action of an individual or a family, [...] there is no opportunity for association. For Proudhon, mutualism involved creating "industrial democracy", a system where workplaces would be "handed over to democratically organised workers' associations. [...] We want these associations to be models for agriculture, industry and trade, the pioneering core of that vast federation of companies and societies woven into the common cloth of the democratic social Republic". He urged "workers to form themselves into democratic societies, with equal conditions for all members, on pain of a relapse into feudalism". This would result in "[c]apitalistic and proprietary exploitation, stopped everywhere, the wage system abolished, equal and just exchange guaranteed". Workers would no longer sell their labour to a capitalist but rather work for themselves in co-operatives. As Robert Graham notes: "Proudhon's market socialism is indissolubly linked to his notions of industrial democracy and workers' self-management". K. Steven Vincent notes in his in-depth analysis of this aspect of Proudhon's ideas that "Proudhon consistently advanced a program of industrial democracy which would return control and direction of the economy to the workers". For Proudhon, "strong workers' associations [...] would enable the workers to determine jointly by election how the enterprise was to be directed and operated on a day-to-day basis". Mutualists argue that free banking should be taken back by the people to establish systems of free credit. They contend that banks have a monopoly on credit, just as capitalists have a monopoly on the means of production and landlords have a monopoly on land. Banks are essentially creating money by lending out deposits that do not actually belong to them, then charging interest on the difference. Mutualists argue that by establishing a democratically run mutual bank or credit union, it would be possible to issue free credit so that money could be created for the benefit of the participants rather than for the benefit of the bankers. Individualist anarchists noted for their detailed views on mutualist banking include Pierre-Joseph Proudhon, William B. Greene and Lysander Spooner. Some modern forms of mutual credit are LETS and the Ripple monetary system project. In a session of the French legislature, Proudhon proposed a government-imposed income tax to fund his mutual banking scheme, with some tax brackets reaching as high as 33​1⁄3 percent and 50 percent, which was turned down by the legislature. This income tax Proudhon proposed to fund his bank was to be levied on rents, interest, debts and salaries. Specifically, Proudhon's proposed law would have required all capitalists and stockholders to disburse one-sixth of their income to their tenants and debtors and another sixth to the national treasury to fund the bank. This scheme was vehemently objected to by others in the legislature, including Frédéric Bastiat. The reason given for the income tax's rejection was that it would result in economic ruin and that it violated "the right of property". In his debates with Bastiat, Proudhon did once propose funding a national bank with a voluntary tax of 1%. Proudhon also argued for the abolition of all taxes. I have shown the contractor, at the birth of industry, negotiating on equal terms with his comrades, who have since become his workmen. It is plain, in fact, that this original equality was bound to disappear through the advantageous position of the master and the dependent position of the wage-workers. In vain does the law assure the right of each to enterprise. [...] When an establishment has had leisure to develop itself, enlarge its foundations, ballast itself with capital, and assure itself a body of patrons, what can a workman do against a power so superior? Beneath the governmental machinery, in the shadow of political institutions, out of the sight of statemen and priests, society is producing its own organism, slowly and silently; and constructing a new order, the expression of its vitality and autonomy. Dual power should not be confused with the dual power popularized by Vladimir Lenin, which was also theorized by Proudhon, but is referring to a more specific scenario where a revolutionary entity intentionally maintains the structure of the previous political institutions until the power of the previous institution is weakened enough such that the revolutionary entity can overtake it entirely. Dual power as implemented by mutualists and agorists is the development of the alternative institution itself, which can create the Leninist scenario. In Europe, a contemporary critic of Proudhon was the early anarcho-communist Joseph Déjacque. Unlike and against Proudhon, he argued that "it is not the product of his or her labor that the worker has a right to, but to the satisfaction of his or her needs, whatever may be their nature". One area of disagreement between mutualists and anarcho-communists stems from Proudhon's alleged advocacy of labour vouchers to compensate individuals for their labor as well as markets or artificial markets for goods and services. Peter Kropotkin, like other anarcho-communists, advocated the abolition of labor remuneration and questioned "how can this new form of wages, the labor note, be sanctioned by those who admit that houses, fields, mills are no longer private property, that they belong to the commune or the nation?". According to George Woodcock, Kropotkin believed that a wage system in any form, whether "administered by Banks of the People or by workers' associations through labor cheques", is a form of compulsion. Collectivist anarchist Mikhail Bakunin was an adamant critic of Proudhonian mutualism as well, stating: "How ridiculous are the ideas of the individualists of the Jean Jacques Rousseau school and of the Proudhonian mutualists who conceive society as the result of the free contract of individuals absolutely independent of one another and entering into mutual relations only because of the convention drawn up among men. As if these men had dropped from the skies, bringing with them speech, will, original thought, and as if they were alien to anything of the earth, that is, anything having social origin". Criticism from pro-market sectors has been common as well. Economist George Reisman charges that mutualism supports exploitation when it does not recognize a right of an individual to protect land that he has mixed his labor with if he happens to not be using it. Reisman sees the seizure of such land as the theft of the product of labor and has said: "Mutualism claims to oppose the exploitation of labor, i.e. the theft of any part of its product. But when it comes to labor that has been mixed with land, it turns a blind eye out foursquare on the side of the exploiter". Kevin Carson is a contemporary mutualist and author of Studies in Mutualist Political Economy. In its preface, Carson describes this work as "an attempt to revive individualist anarchist political economy, to incorporate the useful developments of the last hundred years, and to make it relevant to the problems of the twenty-first century". Contemporary mutualists are among those involved in the Alliance of the Libertarian Left and in the Voluntary Cooperation Movement. Carson holds that capitalism has been founded on "an act of robbery as massive as feudalism" and argues that capitalism could not exist in the absence of a state. He says that "[i]t is state intervention that distinguishes capitalism from the free market". He does not define capitalism in the idealized sense, but says that when he talks about "capitalism" he is referring to what he calls "actually existing capitalism". He believes the term "laissez-faire capitalism" is an oxymoron because capitalism, he argues, is "organization of society, incorporating elements of tax, usury, landlordism, and tariff, which thus denies the Free Market while pretending to exemplify it". However, he says he has no quarrel with anarcho-capitalists who use the term "laissez-faire capitalism" and distinguish it from "actually existing capitalism". He says he has deliberately chosen to resurrect an old definition of the term. However, many anarchists including mutualists continue to use the term and do not consider it an old definition of the term. Carson argues that the centralization of wealth into a class hierarchy is due to state intervention to protect the ruling class by using a money monopoly, granting patents and subsidies to corporations, imposing discriminatory taxation and intervening militarily to gain access to international markets. Carson's thesis is that an authentic free market economy would not be capitalism as the separation of labor from ownership and the subordination of labor to capital would be impossible, bringing a classless society where people could easily choose between working as a freelancer, working for a fair wage, taking part of a cooperative, or being an entrepreneur. As did Tucker before him, he notes that a mutualist free market system would involve significantly different property rights than capitalism is based on, particularly in terms of land and intellectual property. ^ "Involved with radical politics and in his contact with the Marxists, he [Proudhon] soon rejected their doctrine, seeking rather a middle way between socialist theories and classical economics". Irving Horowitz (1964). The Anarchists. Dell Publishing. ^ "Some critics object to the use of the term capitalism in reference to historical or actually existing economic arrangements, which they term mixed economies. They reserve the term for the abstract ideal or future possibility of a genuinely free market. This sort of free-market capitalism may closely follow Carson's free-market anti-capitalism in its practical details except for the fact that Carson does not recognize a right of an individual to protect land that he has transformed through labor or purchased to be protected when he is not using it. Carson, like other mutualists, only recognize occupancy and use as the standard for retaining legitimate control over something. According to Carson, "For mutualists, occupancy and use is the only legitimate standard for establishing ownership of land, regardless of how many times it has changed hands. An existing owner may transfer ownership by sale or gift; but the new owner may establish legitimate title to the land only by his own occupancy and use. A change in occupancy will amount to a change in ownership. Absentee landlord rent, and exclusion of homesteaders from vacant land by an absentee landlord, are both considered illegitimate by mutualists. The actual occupant is considered the owner of a tract of land, and any attempt to collect rent by a self-styled landlord is regarded as a violent invasion of the possessor's absolute right of property". (p. 200 of Carson's "Mutualist Political Economy"). ^ See "The Iron Fist Behind the Invisible Hand". ^ "For mutualists, occupancy and use is the only legitimate standard for establishing ownership of land, regardless of how many times it has changed hands. According to the mutualist Kevin Carson "A change in occupancy will amount to a change in ownership." An existing owner may transfer ownership by sale or gift; but the new owner may establish legitimate title to the land only by his own occupancy and use. A change in occupancy will amount to a change in ownership. Absentee landlord rent, and exclusion of homesteaders from vacant land by an absentee landlord, are both considered illegitimate by mutualists. The actual occupant is considered the owner of a tract of land, and any attempt to collect rent by a self-styled landlord is regarded as a violent invasion of the possessor's absolute right of property. (p. 200 of Carson's "Mutualist Political Economy". ^ "Introduction". Mutualist.org. Retrieved 2010-04-29. ^ Proudhon's Solution of the Social Problem, Edited by Henry Cohen. Vanguard Press, 1927. ^ Woodcock, George. Anarchism: A History of Libertarian Ideas and Movements, Broadview Press, 2004, p. 20. ^ Carson, Kevin A. Studies in Mutualist Political Economy Preface Archived 2010-12-21 at WebCite. ^ Pierre-Joseph Proudhon, What Is Property?, p. 281. ^ Hamilton, Peter (1995). Émile Durkheim. New York: Routledge. p. 79. ISBN 0415110475. ^ Faguet, Émile (1970). Politicians & Moralists of the Nineteenth Century. Freeport: Books for Libraries Press. p. 147. ISBN 0836918282. ^ Knowles, Rob. "Political Economy from below : Communitarian Anarchism as a Neglected Discourse in Histories of Economic Thought". History of Economics Review, No.31 Winter 2000. ^ Swartz, Clarence Lee. What is Mutualism? ^ Joshua King Ingalls, "A Practical Movement for Transition," Spirit of the Age, II, 13 (March 30, 1850), pp. 202–04. ^ Albert Brisbane, "The Mutualist Township," The Spirit of the Age, II, 12 (March 23, 1850), 179–83. ; II, 13 (March 30, 1850), 200-202. ^ Pierre-Joseph Proudhon, "The Coming Era of Mutualism," Spirit of the Age, I, 7 (August 18, 1849), 107–08. ^ Wendy McElroy. "The culture of individualist anarchist in Late-nineteenth century America"
^ a b "Anarchism" at the Encyclopædia Britannica online. ^ "A Mutualist FAQ: A.4. Are Mutualists Socialists?". Mutualist.org. Archived from the original on 2009-06-09. Retrieved 2010-04-29. ^ McKay, Iain., An Anarchist FAQ Volume One, AK Press, 2007, pp. 23, 24. ^ Dolgoff, Sam., Bakunin On Anarchy, Vintage Books, 1972, pp. 366. ^ Woodcock, George (1962). Anarchism: A History of Libertarian Ideas and Movements. The World Publishing Company. ISBN 978-0140168211. ^ "Some background about the name: What is mutualism?". Mutualism.de. Retrieved 2010-04-29. ^ "Suppose that all the producers in the republic, numbering more than ten millions, tax themselves, each one, to the amount of only one per cent of their capital ... Suppose that by means of this tax a bank be founded, in Competition with the Bank (miscalled) of France, discounting and giving credit on mortgages at the rate of one-half of one per cent." Henry Cohen, ed. Proudhon's Solution of the Social Problem. Vanguard Press, 1927. pp. 118–19. ^ Henry Cohen, ed. Proudhon's Solution of the Social Problem. Vanguard Press, 1927. p. 46. ^ Proudhon, General Idea of the Revolution in the Nineteenth Century. Translated by John Beverly Robinson. New York: Haskell House Publishers, Ltd., 1923, 1969 . p. 243. ^ Lenin, Vladimir (April 1917). "The Dual Power". ^ Lenin, Vladimir (May 1917). "Has Dual Power Disappeared?". ^ Trotsky, Leon (1930). "Dual Power". ^ Bookchin, Murray (1996), The Third Revolution: Popular Movements in the Revolutionary Era, Volume 2, A&C Black, p. 115, Proudhon made the bright suggestion, in his periodical Le Représentant du peuple (April 28, 1848), that the mass democracy of the clubs could become a popular forum where the social agenda of the revolution could be prepared for use by the Constituent Assembly—a proposal that would essentially have defused the potency of the clubs as a potentially rebellious dual power. ^ Graham, Robert (2005). Anarchism: A Documentary History of Libertarian Ideas: from Anarchy to Anarchism (300 Ce to 1939). Black Rose Books. ISBN 978-1-55164-251-2. ^ Déjacque criticized French mutualist anarchist Pierre-Joseph Proudhon as far as "the Proudhonist version of Ricardian socialism, centred on the reward of labour power and the problem of exchange value. In his polemic with Proudhon on women's emancipation, Déjacque urged Proudhon to push on 'as far as the abolition of the contract, the abolition not only of the sword and of capital, but of property and authority in all their forms,' and refuted the commercial and wages logic of the demand for a 'fair reward' for 'labour' (labour power). Déjacque asked: 'Am I thus... right to want, as with the system of contracts, to measure out to each—according to their accidental capacity to produce—what they are entitled to?' The answer given by Déjacque to this question is unambiguous: 'it is not the product of his or her labour that the worker has a right to, but to the satisfaction of his or her needs, whatever may be their nature.' [...] For Déjacque, on the other hand, the communal state of affairs—the phalanstery 'without any hierarchy, without any authority' except that of the 'statistics book'—corresponded to 'natural exchange,' i.e. to the 'unlimited freedom of all production and consumption; the abolition of any sign of agricultural, individual, artistic or scientific property; the destruction of any individual holding of the products of work; the demonarchisation and the demonetarisation of manual and intellectual capital as well as capital in instruments, commerce and buildings. "Alain Pengam. "Anarchist-Communism"
^ The persistent claim that Proudhon proposed a labor currency has been challenged as a misunderstanding or misrepresentation. See, for example, McKay, Iain. "Proudhon’s Constituted Value and the Myth of Labour Notes." Anarchist Studies. Spring 2017. ^ "RECD = Really Existing Capitalist Democracy by Noam Chomsky". ^ McKay, Iain. An Anarchist FAQ Volume One, AK Press, 2007, pp. 227. Studies in Mutualist Political Economy by Kevin Carson. For more of Carson's points of view about mutualism you can check his blog. Journal of Libertarian Studies Vol. 20 Num. 1. This issue is devoted to Kevin Carson's Studies in Mutualist Political Economy. It includes critiques and Carson's rejoinders. Mutualism: A Philosophy for Thieves by George Reisman.